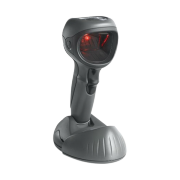 The hybrid imagers of the DS9900 Series from Zebra bring the future to the POS in retail, at check-in areas and in hospitality when it comes to incredibly fast and extremely precise scanning – the DS9908R model also reads RFIDs. The imagers are designed for ambidextrous, hands-free scanning. That's why they are just as comfortable to operate in the right hand as in the left. They also reliably scan in presentation mode when the user has his hands full. The DS9900 Series is equipped with Zebra's exclusive »PRZM Intelligent Imaging« technology for the best performance in reading 1D, 2D and Digimarc barcodes. The DS9900 Series reads (nearly) everything: electronic barcodes on smartphones, poorly readable, crumpled, faded, glossy, damaged barcodes, as well as those with a poor contrast. The DS9908 has IP52 certification and is impact-resistant from 1.5 m. The DS9908R is IP42-certified and is impact-resistant from 1.2 m.
Order the hybrid imagers of the Zebra DS9900 Series with your sales representative. Give us a call today!